With the Chinese New Year and the Year of the Rooster upon us, CHD Expert decided to evaluate recent trends within the Asian restaurant landscape across the United States. Over the years we have seen Asian food transform from a specialized market into some of the most popular menu types in the USA. As of February 2017, there are more than 65,500 Asian restaurants in the United States. A variety of sub-menu categories make up the overall Asian restaurant landscape, including Chinese, Japanese, Sushi, Korean, Thai, Vietnamese, Indian / Pakistani / Bangladeshi / Sri Lankan, Other Asian. The Chinese menu type is by far the most prevalent, making up approximately 40% of the Asian restaurant landscape, but the Japanese and Sushi menu types have become more common in recent years. The Japanese restaurant accounts for 12% of the Asian restaurant landscape, while Sushi makes up around 9%. When broken down by segment, around 80% of Asian restaurants are Full Service Restaurants while 20% are Limited Service Restaurants. Full Service Restaurants (FSR) offer table service and operate with a wait staff, while Limited Service Restaurants (LSR) have customers pay for their food at a counter. Want more details on the Asian restaurant landscape in the USA? CHD Expert evaluated the most recent data within its foodservice database and packaged the most interesting facts and figures into a trends report designed to help foodservice industry professionals better understand the popularity of Asian restaurants in the United States. 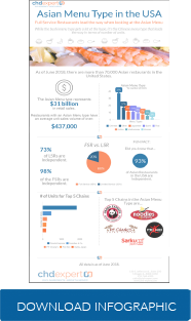 To access the 2017 Asian Restaurant Landscape Infographic in its entirety, please click here.